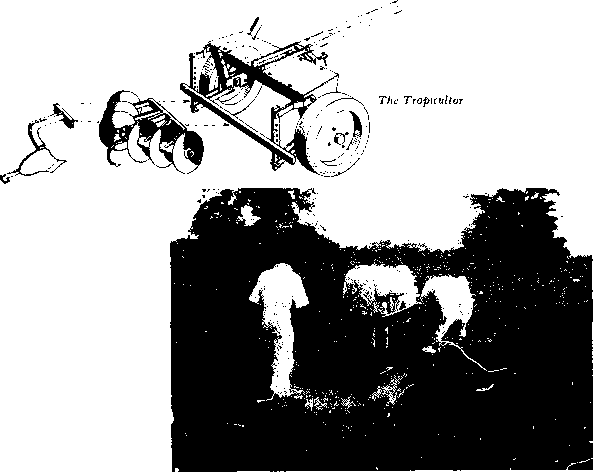 Described below are some examples of Jean Nolie's ingenuity at designing multipurpose agricultural equipment for widely varying soil and cropping conditions. The emphasis on economy, ease of operation and maintenance, and versatility is consistent. Additional information on Nolle s machines may be obtained from the man u fac t urer, Mon to ti France. The Polycultor prepared for hoeing co-ton in Uganda. Jean Nolle features a hand lever for raising the implements and two handles on the toolbar for steering. The lift is connected to the toolbar by a chain for easy depth adjustment. The toolbar is designed to carry from six to 12 cultivator tines. It can carry one or two ridgers, three markers for planting peanuts, a peanut lifter, and a grain drill. The singlebottom plow attaches directly to the axle with a stirrup clamp. Since it is fitted alongside the right wheel, the plow has its own lift. Uniform furrow width is obtained by the right wheel following the previous furrow. 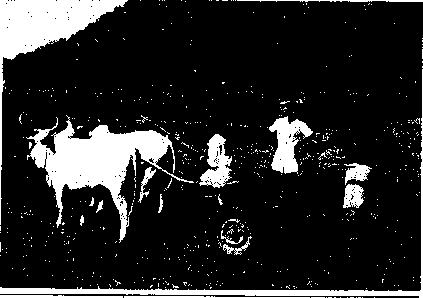 The fanner is seated in the middle of the chassis, beside the plow. Another option is a 500-liter water drum, put in the same place the cart would normally be. Still another is a small mower, driven by the right wheel. The mower is mounted on the side of the platform cart, exactly in its pivot, so that it can be lifted for transport. One of the chief obstacles preventing more widespread use of green manuring practices in Senegal and elsewhere in Africa is that the traditional moldboard plow with oxen is so difficult to keep in the ground with some of the newer, higher cover crops like sorghum. The stability and weight of the polycultor makes this much less difficult. The long stems are bent forward by the axle, so it is easier for the plow to cover them with earth. a duck foot sweep, and the sides with left- and right-hand side shovels. The rear bar can be adapted to carry a furrow plow, a ridger, and a rigid tooth harrow. Disc and spring-tooth harrows can also be attached. "Che width and length of the sine can be modified by means of clamp-on extensions, thereby making it possible to use the tool with two wheels or two skids, with one or two ridgets, with five tines instead of three, and other options. All in all, the sine is a fine example of a machine that is readily adaptable to the job at hand and the strength of the animals. Ranking in size somewhere between the sine and the polycultor, the saloum was designed for areas with soils too hard for the lighter sine to penetrate. The square chassis and two forward wheels make it possible to load the saloum with a bag of sand to achieve greater weight for plowing or cultivating in clay soils. The machine was also valuable for harvesting peanuts in heavy soils. But the saloum was not without its disadvantages. With the two front wheels, it was almost impossible to steer effectively for hoeing. Since the wheels were not adjustable in height, it was also impossible to plow. Nor was it possible to adjust the width of the track. For these reasons, Nolle abandoned the satoum and replaced it with the ariana. 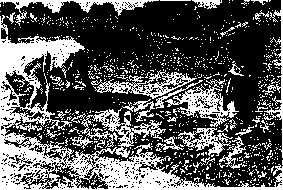 The Ariana preparing a seedbed with a Cambridge roller and a spring-tooth harrow. 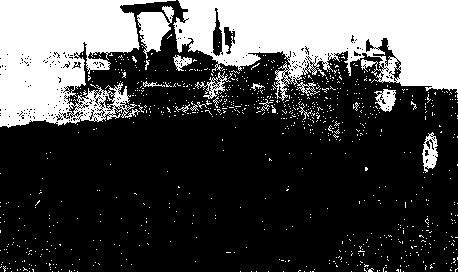 Jean Nolle was required was a reversible plow that would place the final furrow alongside the field rather than in it. The ridge cultivation also required more clearance under the chassis. On Noile's ariana, the two wheels for plowing are attached with clamps to the upright bars. Track width is adjustable from 30 to 70 centimeters. Besides the furrow plow and the reversible plow, the machine can be adapted with implements for ridging, cultivating, planting, fertilizing and peanut harvesting. 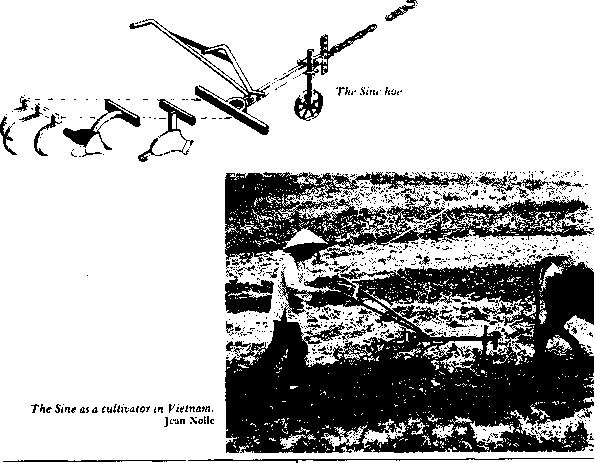 For hoeing and all conventional cultivation work, the two wheels are replaced by a single wheel in the front center. multipurpose tool carrier. Unlike its predecessor, however, the tropicultor is adjustable lor rows of varying width, and its chassis is made of two steel pipes making it high enough for use above growing crops. The angle of penetration of the implements is controlled by an adjustment of the shaft. The ability to lock the toolbar in the low working position represents a real breakthough in the design of multipurpose tool carriers of this sort. It frees the operator from having to constantly lean down on the handles and devise crude weighting schemes for the cart. With a track width that can be adjusted from 60 to 160 centimeters, and a ground clearance of 65 centimeters, the tropicultor can work in almost any soil and cropping conditions. Like Nolle's other machines, the tropicultor offers various extensions and adaptors that permit it to function as a grain drill, disc harrow, mower, reversible plow, planter, and cultivator. All attachments are easily fastened to the toolbar with standard clamps and pins. AH told, the tropicultor will accept 24 different implements that make possible over 30 uses on the small farm. Such versatility greatly enhances the independence of the farmer using the device.